Redwood National and State Park is home to the world-famous redwood trees that tower up to 379 feet (115m) in the air. Home to 45 percent of the remaining old-growth redwood forests in the world, the park is the best place to see the magnificent trees. 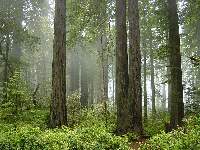 Aside from the redwoods, the park has nearly 40 miles (64km) of wild coastline, as well as prairies and oak woodlands. The park has over 200 miles (322km) of hiking trails, and offers outdoor activities like horseback riding, kayaking, camping, mountain biking and bird watching. Opening times: Redwood National and State Parks is always open, while the visitors centre and campground's hours vary by season. Check the website or contact the visitors centre for specific dates.